Happy Huggers launched their new e-store http://www.happyhuggers.com.sg on 31st October 2013, a first of its kind featuring a variety of skincare products from Japan. Well, one of the interesting products they have on board is ASTALIFT COLLAGEN 10000. The collagen production reduces in our body as we age. Due to lack of collagen, skin looses its firmness, sags, dries and roughens. 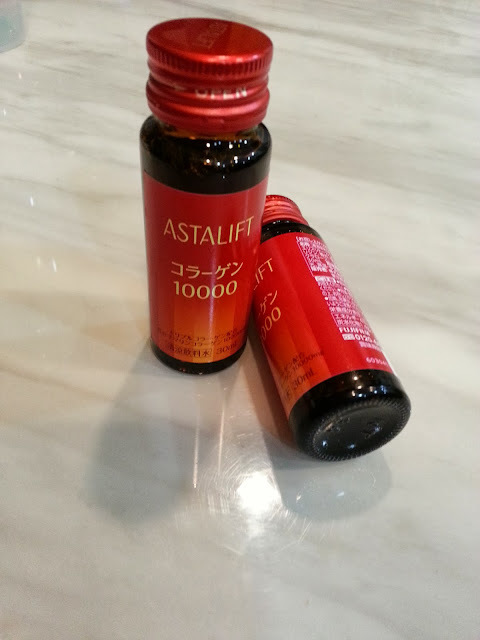 ASTALIFT Collagen 10000 boosts the collagen level in the body. Low Molecular Marine Collagen, Proline and Lysine is combined with antioxidant Astaxanthin, Vitamin C and Citrus Polyphenol to help keep the skin stay moisturized and firm. It is recommended to take it daily before bed to replenish firmness and moisture lost during the day. Like Happy Huggers facebook page (https://www.facebook.com/happyhuggers) and flash the page at ASTALIFT branches at ION Orchard and JEM to receive free ASTALIFT samples. Both offers are valid till 30th November 2013. If you like this blogpost, please go to Happy Huggers Facebook (https://www.facebook.com/happyhuggers) page and like my post.